" NBA at 50 - Orlando Magic Commemorative Video - 1997. 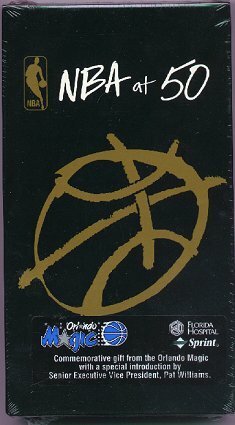 (1000) NBA at 50 - Orlando Magic Commemorative Video - 1997 -Condition: Mint In Box - Never Opened. Wonderful Commemorative Video given out by the Orlando Magic. Video celebrates the 50th Anniversary of the NBA. Included in the video are: George Mikan; The Russell-Chamberlain and Magic-Bird Rivalries; the building of Red Auerbach's Celtic Dynasty; All-time greats Jerry West, Oscar Robertson and Elgin Baylor; the Michael Jordan Phenomenon and more. Copywrited in 1996 and is 90 Minutes long. Price: $8.00 + shipping.